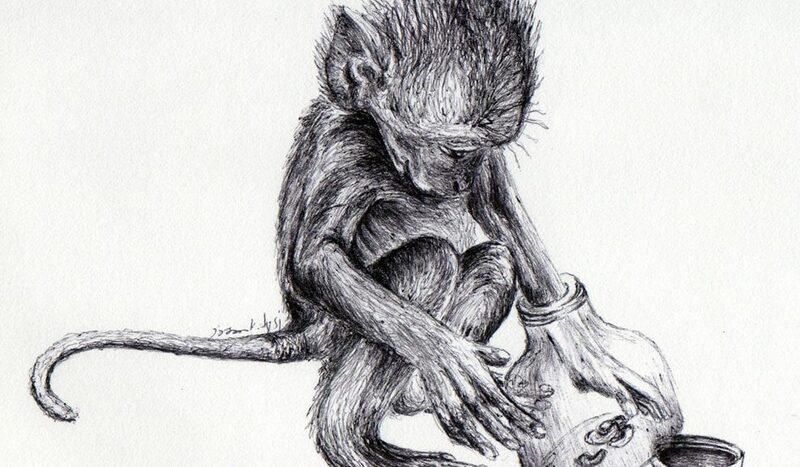 When I was a kid, an exchange student from Malaysia told me the story of how to catch a monkey. Basically, you take a hollowed out gourd, make an opening just big enough for a monkey’s paw to fit through, and place a few nuts inside. The monkey will reach in and grab the treats but his clenched fist is too big to pull it back out through the hole. But, being persistent and a little greedy, the monkey will try everything to pull the nuts out with his hand…everything except letting go. Then you simply pick up the gourd and the monkey along with it. Even when his own survival is at stake, the monkey still won’t let go. I always thought this was an interesting story and for some reason, it seemed to stay with me. Years later, I realized the significance of this in our own, human lives. How many times do we grasp for something and try to hold on to it with all our might? And, how often does this small goal (the treat in the gourd) seem so important that we lose sight of an even bigger goal (not getting captured)? Most often, the nut in the gourd is an idea, desire or belief that consumes us, even if it puts us in greater danger. In warfare, this is called “target fixation”, when the goal of shooting the enemy becomes so laser focused that you lose awareness of someone else who might be trying to shoot at you. Yes, it’s very important to be committed to a particular goal, but not so much that you disregard the bigger picture. Runners find extra adrenaline to finish a race, only to collapse at the end, dehydrated and at risk of something even more damaging. Other times, we are actually grasping at something negative like a regret or resentment. Or, a stubborn belief system, such as: “This is just the way things should be” can be detrimental to our greater good. Maybe things should be a certain way, or, that this person shouldn’t have done this to me, but often times that’s not the case. Holding on to what “would have, could have, should have” been, can prevent us from seeing what constructive things we might actually be able to do in the here and now. Our distracted “monkey mind” gets us off track and focused on the small while remaining oblivious to the greater, more important things. To this day, I know a few people who still refuse to wear a seatbelt in their cars because they’re uncomfortable, even though it’s the law to buckle up. Apparently, they find a small comfort more appealing than preventing a much greater discomfort if they were to be involved in a car accident. The solution lies in backing up for a moment to get a little perspective. We can ask: “Is holding on to this desire so important that I’m willing to put myself in peril?” , it’s a simple risk/reward assessment, but, when we are so fixated on the goal, we often disregard the potential pitfalls. In Buddhism, this relates to desire, which is recognized as the source of all suffering. More specifically it’s not the desire, it’s the relentless grasping for it, or our attachment to the desire that causes the suffering. So ask yourself if you are holding on too tightly to something, physically or emotionally, that it is actually causing more trouble than if you would simply let go. Letting go may be simple in theory, but often difficult in practice, which is why we hold on to pain and other negativities much longer than we need to. It takes the courageous act of surrender to let go the small in favor of the great. So are you ready to give up the treat in the gourd and remain free, or, are you still going to grasp on to it with all your might and get captured?